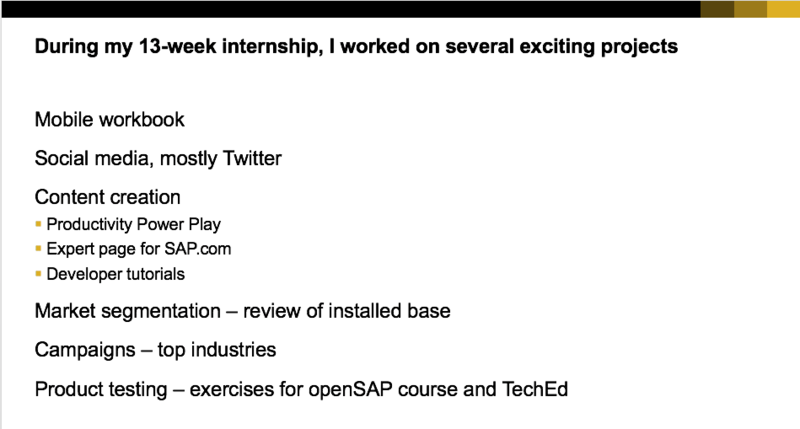 As I conclude my 13 weeks as a Product Marketing Intern for the SAP Screen Personas team, I find myself reflecting on the time I’ve had here. One of the absolute highlights of my journey at SAP was my team. It was so incredible to be part of such a well-knit and welcoming team. Everyone was so willing to help me out when I got stuck at any point and we shared a passion for customer success, making working together so simple and seamless. On most days, our team met for lunch and sat together, chatting about projects, news, and anything else. Additionally, we went out on team bonding events occasionally, but usually at least once a week. I played several soccer games with my collogues, which was incredibly fun and allowed for me to get to know my coworkers outside of the office. I even assisted in a few goals being scored! We even went paint balling, which was a totally new experience for me, but I truly enjoyed spending time with my team in such an exciting way. Since my start, I feel I have accomplished a lot. From creating a mobile workbook and working on social media and content creation, to marketing campaigns and product testing, I’ve truly learned immensely during my time here. As I began my internship, I was to create a mobile workbook to help our customers learn how to use the Slipstream Engine to create a mobile application. The team and I worked to piece together a detailed guide, which I organized and authored some of the content. The workbook has been deployed to over 20 of our partners and we plan to publish it online following TechEd Las Vegas in the coming months. Working on social media and content creation was a continuous process during my internship. I managed the social media of SAP Screen Personas, with the help of my colleague Conrad, to develop and author content through Twitter. We analyzed our audience data, playing around with different times to post, type of content and what images worked. Additionally, I directed a new Productivity Power Play video for our team, which are short video tutorials to use our product. Coming across the feature called Quick Styles within our product, I realized there wasn’t a lot of information around how to use it. Working with the product experts, we created a script, revised it several times and then worked with the production team to film it. The video, along with another video I took over, is live on our page and on YouTube for our customers benefit, which can be found here. I also headed and completed the development of both an expert page for sap.com, along with learning a new sort of “code” language, Markdown, to build the developer tutorials page for SAP. Finally, I spent the last few weeks of my internship with a lot of data. I reviewed our market segmentation and used the information I found to build a campaign around which of the top companies in various industries use our product. Our team will work to share the new found information via LinkedIn to drive traffic to our new openSAP course and website. To wrap up my internship, I also assisted with product testing through exercises for our openSAP course and TechEd. 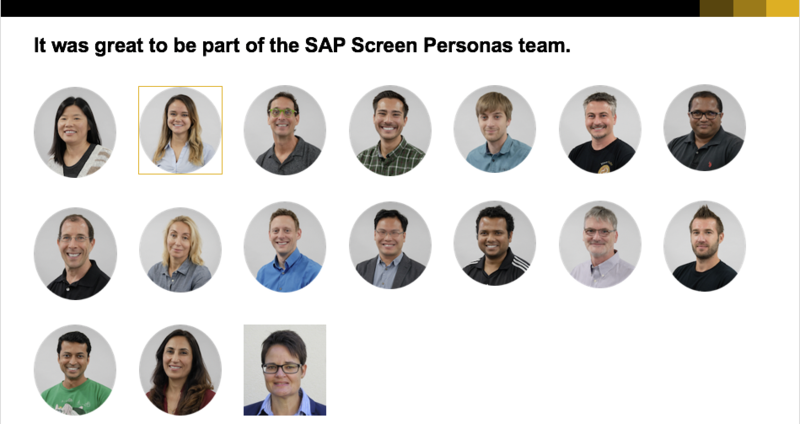 With a hunger to learn, the SAP Screen Personas team was nothing short of an incredibly fulfilling experience. I learned a lot about the product, company and myself as well. Working with Peter and Conrad gave me new insights to marketing from staying brand compliant, working on market strategy, to creating useful content. We worked through following SAP Brand tools guidelines for our social media, to ensure our channel was performing well and on brand. We crafted marketing campaign briefs for both the top industries campaign and also a Twitter Live chat campaign I ran, which did not go as planned. Even though my idea may not have been incredibly successful, my colleagues did not doubt my ability and instead we examined the benefits we received instead of what didn’t work. I learned so much from my mentors and my team and I couldn’t have been more grateful for the opportunity. 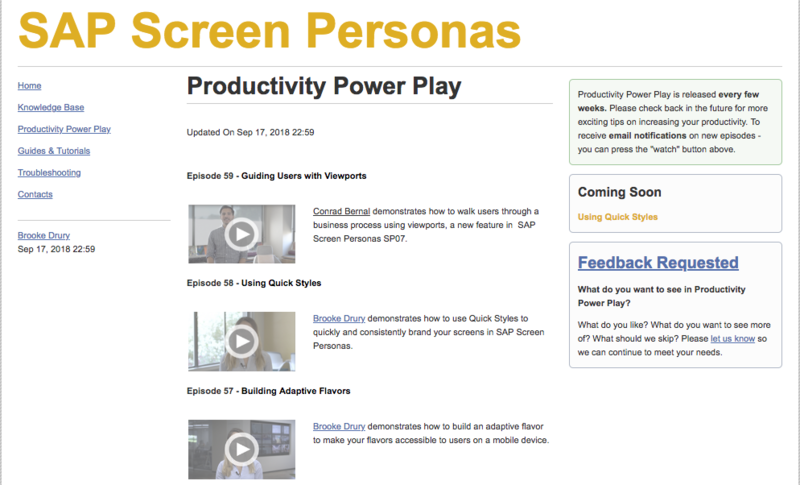 To conclude, my journey with SAP Screen Personas may be coming to an end, but my journey with SAP continues. As I transition back to UC Santa Cruz for the last 10 weeks as an early graduate, I will continue to work for SAP within my new role as a working student product marketing intern for the ICN Blockchain team. 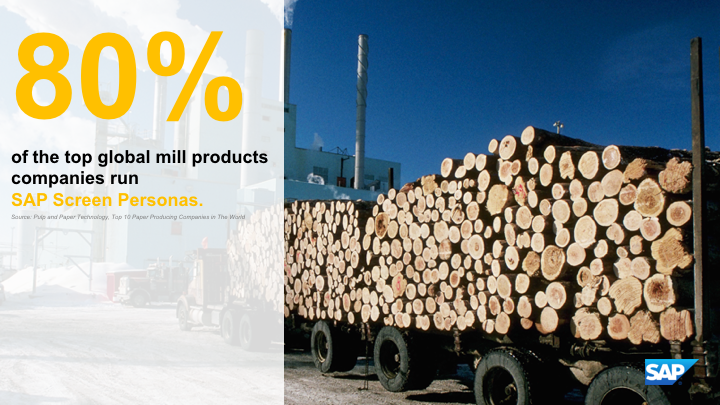 I will continue to learn and grow from SAP and the incredible technology and business that helps our customers run at their best.